If you like posh, fine dining then I suggest you stop reading now because I'll tell you now Meat Liquor is not for you. After visiting their London division a couple of years ago I've been wanting to try the new restaurant at Leeds Trinity shopping centre so I took Jason along with me to enjoy this no-frills burger experience. Getting to it was probably the most difficult part; it's actually hidden down a little alley behind Victoria's Secret... kind of like Trinity's dirty little burger secret. Downstairs in the dining area I could tell it was a different vibe to that of the London restaurant; it's not as dark and the chairs and tables are ever so slightly more luxurious, probably a nicer eating experience because you can actually see your food in all its meaty, greasy glory. As you can see, totally no frills. No tablecloths, no napkins, just the essentials; kitchen roll, bottled sauces and they even treat you to a mat for your drink. The service was quick and friendly; we didn't go for any fancy drinks (but there is the option to have some pretty lethal cocktails) and I already knew exactly what I wanted; a bacon cheeseburger with cheese fries... basically all the cheese. Jason eventually decided on the same with some onion rings (we shared the sides because I knew how big they'd be from previous experience). If burgers aren't your bag there'll be something you'll enjoy whether it's chicken, ribs, a chilli dog or a vegetarian option of Greek salad or a halloumi and mushroom burger. The first thing he said was 'do you not get a plate?'... I'm sure you could request a plate but I said the idea is that you eat the food straight from the tray so he squeezed some tomato sauce onto the paper with a puzzled looking on his face and started tucking in. I knew exactly what to expect; a burger medium cooked, smothered in cheese with lashings of sauce and pickles. I was in burger heaven. If you can eat a burger from Meat Liquor without having to wipe your mouth then you're doing it wrong. It's meant to be a messy experience, it's not a clean burger it's saucy and a little bit greasy but my god it tastes good. 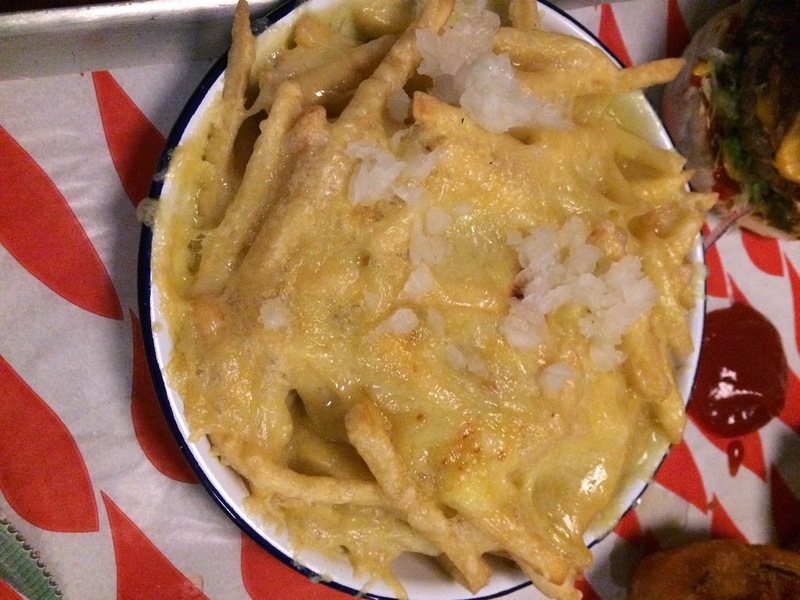 The cheese fries were everything I expected and more; with grated onion on top they have a unique taste that separates them from your regular cheese fries that you'd get anywhere else and they really don't go easy on the cheese which is another reason why I love them. One thing Jason did compliment was the onion rings; they're massive, crispy on the outside and fluffy on the inside... everything an onion ring should be. Sharing the sides was definitely a good call because we were both so full when we'd finished but although Jason ate it all his review wasn't great. It's all down to personal preference though, not down to the quality of the food. He prefers a flatter burger with a bigger bun rather than the higher stacked burgers that they serve at Meat Liquor and I just don't think he 'got' the dining experience as a whole. We ate at lunch but I would never bring him at night because I would imagine that the feel of the place changes again (the lights are probably dimmer and the music will be louder). The price was about average for a burger joint in the centre of leeds; burgers are £8.50 and the sides are priced between £3 and £6 (which might sound a bit steep but they are BIG sides, trust me). It's exactly what we'd pay in somewhere like the Handmade Burger Co. and the drinks were very reasonable too (£2.00 for a Diet Coke). 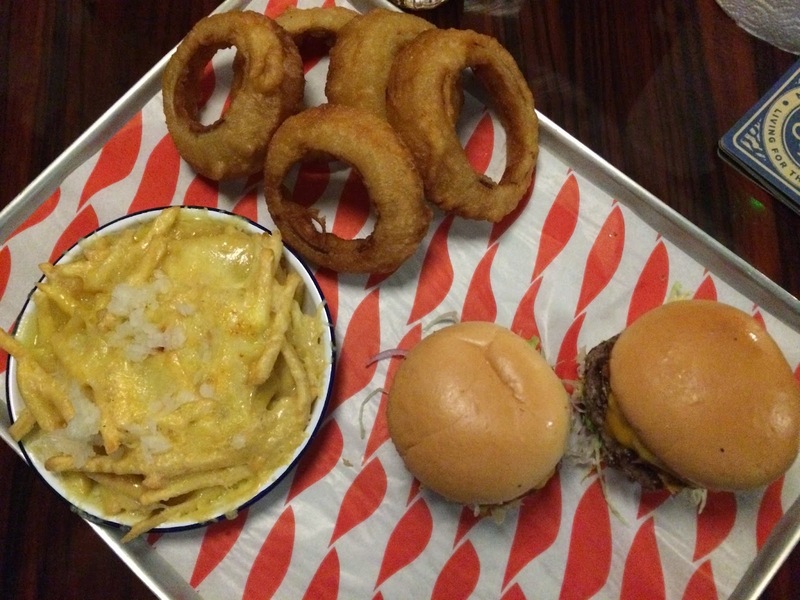 If you like a burger and you don't mind getting it round your mouth then Meat Liquor is the place for you. As long as you know what you're getting and you know you'd enjoy that sort of thing then you'll really love Meat Liquor. I know I love it probably more than I did in London and I'll most definitely return. Have you tried Meat Liquor?